The Library of the Wageningen University has developed several free e-learning modules for self-study or to refresh your information literacy skills. A lot of research data is available online and ready to be reused. But how do you find that one data set you need for your project or study? 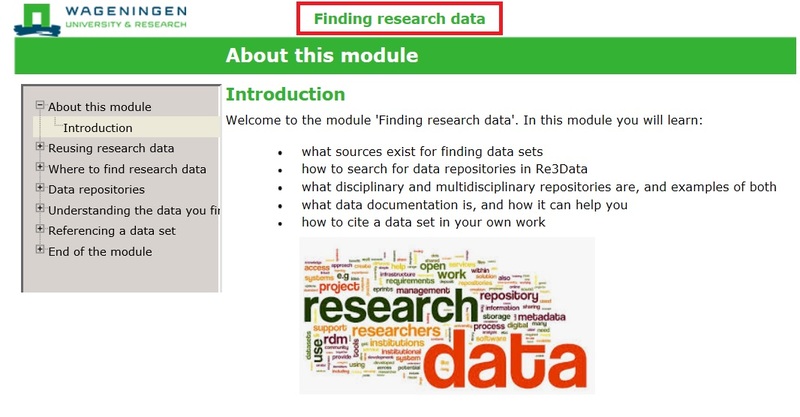 The free online module FINDING RESEARCH DATA helps you get started! This module consists of short texts and exercises on finding and reusing data. The first half explains where you can look for data online, with special attention to data repositories, and gives search tips. The second half explains how to use data documentation (think of Readme-files) to understand the data you find and how to eventually cite the data set you reused. Once you have completed the module, you'll start your data search well prepared! If you have questions about the module or about any other data-related topics, don't hesitate to contact Data Management Support at data@wur.nl.